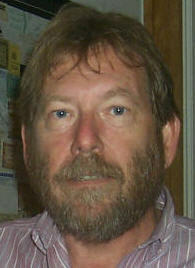 My only brother, Gary, died of liver failure at UCLA Ronald Reagan Medical Center on June 20 at the age of 65. He saved me from the agonizing decision to turn off life-supports which I had been objecting to each day for the prior week. He had turned that authority over to me. It was very difficult, even as a physician, to deny the doctors there imploring me to do so every morning. I can't imagine what a layman would do under such intense pressure. Gary and I discussed the fact that I had this huge trip planned and paid for and if anything happened, I may not be at his funeral. His response was, "Don't worry, I won't be there either." This was very difficult for me but as it turns out it was the best because I could mourn by myself in a foreign place without constant reminders. I dedicated the whole first page of our 1970 Honeymoon trip to him. Click the links if you have not seen it. On December 19th, he would have turned 66. This begins our 8th three month trip through a region of Europe and we are running out of places to go. We settled on the historically important countries of Austria and Hungary (the old Austro-Hungarian Empire) and Czechoslovakia (which is now divided into two countries; Slovakia and the Czech Republic) as well as a little tiny part of the old Yugoslavia that we didn't visit on our 1970 Honeymoon trip and is now an independent country called Slovenia. Since I have reported our trips to Boston several times in the past, I will keep this one short. I woke at 4:40 and 10:30 and got up at 1:00 PM. Dima's daughter, Anastasia, lived with us for a year attending our St. Monica's High School and she had finally flown home last week. I had to fax her transcript to them so she could now apply for a new school in Milano. I spent the rest of the time making sure I had packed everything for the trip. At 2:00 my niece, Mary (Gary's daughter) and her husband Dave, came over to the house to see me off and at 4:15, Marcia drove me from home to Union Station in downtown LA. I unloaded my bags and at 5:55 I bought a Wetzel's pretzel and then the red cap took me on his cart to my train and loaded my bags into my bedroom. At 6:00 Kevin and Gisele brought little Wesley to see me off and my cousin Barb and Dawn drove up from Orange County to do the same. Photo (L-R): Dawn, Wesley, Kevin, Gisele and Barbara. I got a good photo of my son Kevin with his son Wes. Little Wes was really excited to see the lower level lounge and snack bar with his Dad (left) and the upper level dining room. Wes helped me eat my pretzel in my room. At 6:45 the train pulled out of the station 35 minutes late (above right.) I was in Car 430 in Bedroom A. I got my self settled in and at 8:15 I had a very nice dinner in the dining car, worked on the computer and then went to bed. I woke at 4, 5, 6:15 and 8:30 AM. I got up at 10:00 (I lost 1 hour) and at 11:50 we arrived in Albuquerque 8 minutes late. I did my run at the station and around the downtown area; the weather wasn't bad. I got a cappuccino to go at my usual place, the Third Alarm. At 12:40, we departed Albuquerque 30 minutes late. Above left is my room before the bed is made up and on the right is when its all set to go to sleep. At 12:45 I called Msgr. Torgerson and left a message thanking him for having given Gary the Last Rites and informing him of his passing. I was tired and went back to sleep and woke at 2:20. At 3:00 Msgr. called me back. At 7:30 I had dinner and then I slept again until 9:50 and did some work on the computer until calling it a night at 2 AM. I lost another hour during the night. I woke at 1:30 AM, 6, 9:30 and finally at 2:15 PM. At 3:10 we arrived in Chicago 5 minutes early. My car attendant was Sean and he helped me get unloaded from the train. I rolled my bags to the First Class lounge and stored them with my friend. At 4:00 I walked over to the Caribou Coffee shop and had a cappuccino and got free WiFi. At 5:15 I called my friend John Eales and at 5:45 I booked a room at the Crowne Plaza Orlando for the American Academy meeting in October. I walked back to the Amtrak lounge and put my computer in storage and then at 6:10 I did my run through the streets to St. John's Church. When I was finished, at 6:30 I stopped at Big Al's Italian for one of their beef sandwiches. At 6:45 I had dinner at Boston Blackie's (above) [120 S Riverside Plz # 3, 312-382-0700] which consisted of 2 Guinness's and a huge bacon cheeseburger with excellent coleslaw (below.) They are very good. At 7:50 I was back in the station food court and stopped at TCBY for a vanilla frozen yogurt cone which wasn't as good as I get in Santa Monica (which is now closed due to next-store competition from Menchie's.) At 8:00 I went into CVS pharmacy and bought some clear duct tape to repair my cracked Palm phone. At 8:05 I got my bags from storage and at 8:15 the redcap took me and my bags to board the Lake Shore Limited train. At 8:40 there was a wine and cheese party in the lounge car for 1st Class passengers. I enjoyed both the white and red wine along with the grapes, cheese and crackers; all free. At 9:30 we pulled out of the Union Station on time. Because all the large bedrooms were taken when I booked my tickets, I could only get a small roomette and hope for the best. After talking to my car attendant, Susie, and the conductor they considered giving me the empty handicapped deluxe bedroom. He said he could only do that with the approval of Amtrak Guest Rewards (which is how I got my free tickets.) I then called them on my Palm phone and then after she approved it I handed the phone to the conductor who was a little reluctant to talk to her on my phone. After their conversation he warmed a little and then told me I could move. So, at 11:45 Susie helped me move to Bedroom H (the handicap room.) During the night we lost the third hour. I worked on the computer and then went to sleep at 3 AM in a nice big bed. I lucked out again. I woke at 7, 9:30, and 2:30 PM just before we arrived in Bryan, OH at 2:40 PM (1 hour late.) At 3:00 I got a text from Claire that she had confirmed our Lufthansa flight. At 4:05 we arrived in Albany, NY, 90 minutes late. I raced out and did my run on the train platform and at 4:25 we departed, now 70 min late. At 5:00 my time, Gary's Wake was being held at my home (2 PM PDT.) At 5:50 I walked through all five Coach seating cars (below) to the Lounge car. I had my packaged dinner which was very good. It consisted of a caprese salad, beef loins with ouzo pasta, bread and butter and an apple pie. Surprisingly good for packaged stuff. At 9:40 PM, we arrived at Boston South Station only 30 minutes late. Susie helped get my bags off. I rolled my bags outside and at 9:45 caught a cab (#0053) to Melrose. The driver was insane and had no idea where Melrose was. He drove all around stopping at gas stations asking for directions and still kept getting lost. I asked him why he took me when he had no idea where he was going. He told me that his friend would help him on the phone, which of course didn't work. When we finally arrived at Charlie's house, he wanted to charge me $60 from the meter, which he discounted. I had looked up what I paid last year ($28) and told him that was all he was going to get. He finally accepted it and I have no idea why I gave him a tip at all. Everything was now closed in downtown Melrose and Charlie and Cathy were still at the Cape, so I watched a little TV and fell asleep in the chair all alone in the house. I woke and finally went upstairs to bed at around 3 AM. I woke at 5:50, 9:10 and 10:15 on my own. At 11:00 I headed out and did my run from the house to St. Mary's Church and attended the 11:30 Mass there. On my way I got a shot of this family along the bank of the lake. I walked back to Main St. and at 12:30 had a cappuccino at Starbuck's with free WiFi. I did my puzzles and AOL email. At 6:00 Charlie was back home and picked me up. Back at the house Charlie and I enjoyed some Sam Adams beer. 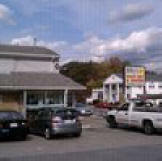 Then at 8:45, we drove to to Billy's Famous Roast Beef [1291 Main St., Wakefield, MA, +1-781-665-2070] takeout (right) to get dinner for all of us. At 8:50 Marcia arrived from the airport; she had gotten lost on the I-90 from Boston due to construction. She finally got there and at 9:00 we had dinner at the house. I enjoyed some Heineken and Marcia had some wine. We then dug into the clam chowder, haddock sandwich with French fries and lobster roll with cole slaw. It was all very good, especially the lobster. After talking and watching TV, we finally went to bed at 2 AM. I woke at 4:30, 8, 12:50 and 3:50 PM. At 4:00 I was up and booked my Amtrak trip from New Orleans to Los Angeles for late October. I drove into town and did my usual run there and stopped at Starbuck's again and used the free WiFi. I drove back to the house and at 9:00 we went for dinner at Stearns and Hill [505 Main St., +1-781-662-9111] with Charlie and Cathy, who had driven up from the Cape. I had a Guinness from the tap and then we got a bottle of Querceto Chianti Classico 2008, which is an excellent Chianti. I started off with a large bowl of steamers. They were fantastic. Then we all shared a "margherita" pizza (below) but they added all those slice tomatoes which is a mistake but it wasn't bad. Charlie and Cathy each got a filet which they said was very good. Our waitress was Debra and the food was excellent. We went back to the house and at 11:15 I had some Shiraz and a Heineken with Charlie. Then I went to bed at 2 AM. I woke at 8:30 and 12:50. I went for my run at 1:30 to St. Mary's again. At 3:45 I bought some cokes at CVS Pharmacy and at 4:00 I had a cappuccino at again at Starbuck's and did my email, downloaded Rush and did my puzzle. I stopped at Turner's Seafood and got a lobster roll to go and then went back to the house. At 5:25 I ate my Lobster roll in the bedroom while I finished my final packing. I left all the clothes and stuff that I would not need in Europe. We said our goodbyes and at 5:30 Marcia drove us to the Logan Airport Enterprise drop-off and we arrived at 5:55 to turn in the car which cost us $121.55. At 6:15 we loaded on the shuttle bus to Terminal E and at 6:40 we waited in the check-in line. At 7:00 we went through the metal detector and then they put me through the full body scanner. Marcia had no scanner or pat down. We arrived in the Air France Business Class Lounge (below) at 7:10 and I had a free coke and a coffee. Since I don't drink alcohol when I'm flying, I passed on all the free beer and wine. At 7:30 I took my Klonopin 0.5 mg. At 7:45 we got in the boarding line and at 7:45 I left a message with the ASCRS hotel booking for Chicago next April. At 8:00 we boarded the plane and sat in Business Class Seats 7H/7K (below.) Marcia enjoyed her complimentary glass of champagne and I had plain water. I do not drink alcohol on the plane.